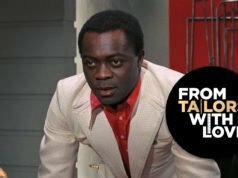 From time to time I’ll be writing about the clothing worn by James Bond villains. Their clothing always says a lot about their character and always contrasts Bond’s clothing. 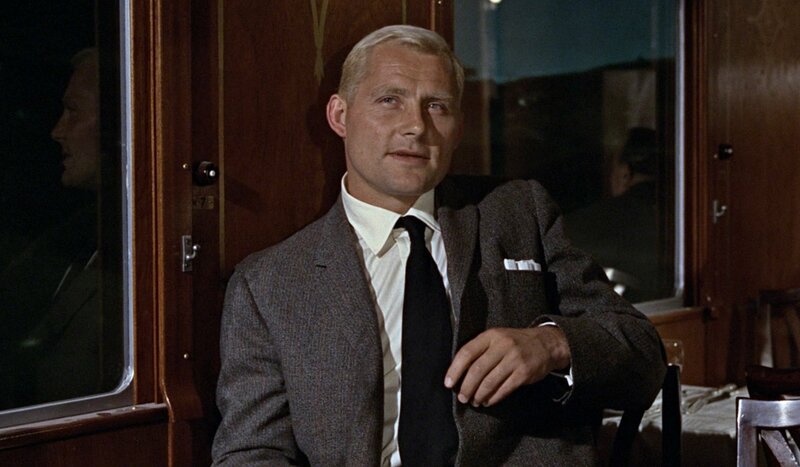 Here we look at Red Grant’s (Robert Shaw) suit in his final scenes in From Russia With Love. 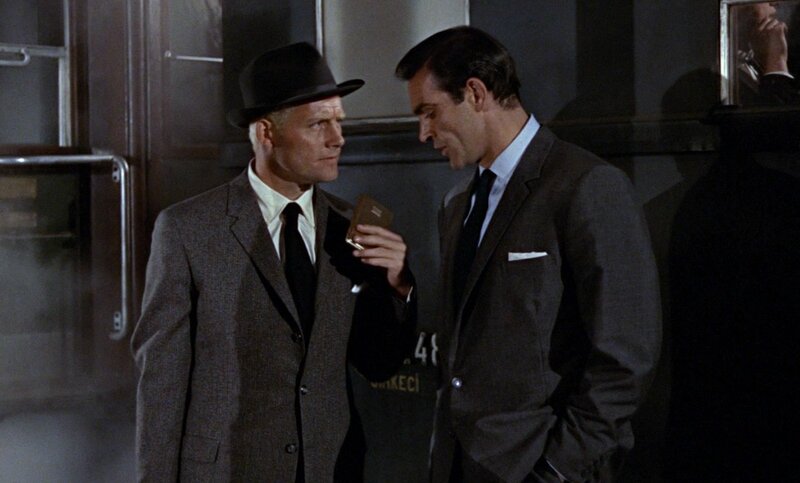 Whilst Bond wears a modern lightweight, button two suit, Grant wears a traditional, heavier button three suit. The cloth is a heavy wool in grey and brown stripes with white pinstripes and a brown windowpane pattern. Other details on the suit jacket include flapped pockets, one-button cuffs and a single vent. The trousers are the same style as Bond’s, with double forward pleats and turn-ups. The Frank Foster cream shirt has a moderate spread collar, English-style placket and double cuffs. Grant’s cufflinks are square with a silver case and a purple stone center. His tie is solid black, knotted in a four-in-hand knot, and he wears a folded white pocket square just like Bond wears. He wears black socks and black plain-toe shoes with elastic side gussets, which is like a shoe-height chelsea boot. 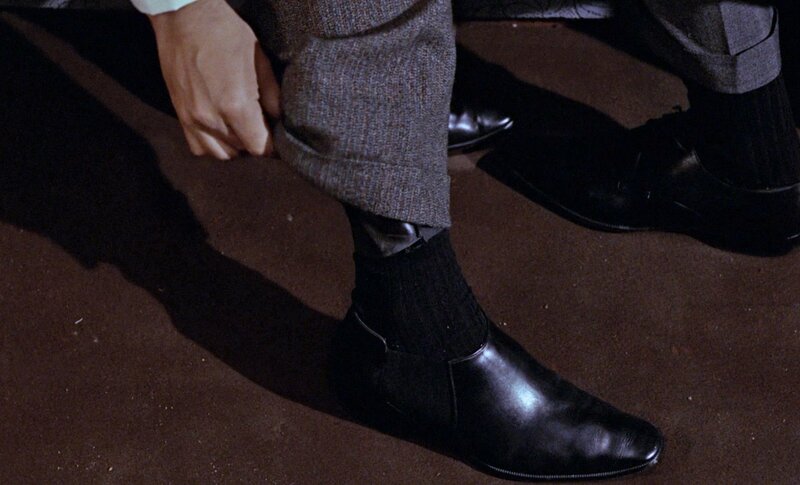 The shoes are actually very similar to what Bond wears in Goldfinger. Grant also wears a dark grey C-crown fedora, taken from Captain Nash after he kills him. Bond later takes the hat for himself after he kills Grant. Hi! I've just found your blog, great stuff! Best regards from Tallinn! Matt, thank you for doing this! It adds a really cool dimension to your blog! You are so observant and I am in awe of your knowledge of suiting and fabrics! 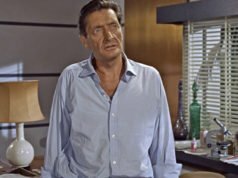 Red Gant's look is a bit more clumsy than Bond here, like an uncouth shadow, the man who drinks red wine with fish! Bond villains nearly always had interesting ensembles important to establishing their character, particularly Blofeld in From Russia with Love and Thunderball when his clothes (and cat) are all the audience are allowed to see. 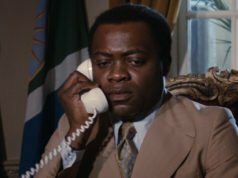 My personal favorite is that of Auric Goldfinger, whose entire wardrobe is golden in tone, from pale yellows to dark browns. A good observation on the chronology of ownership regarding Nash's hat – I had never caught that. A very nice suit for Red Grant. Funny to see that the one Bond is wearing in Skyfall has approximately the same cut (very narrow lapels, 3-button front, single vent, straight flapped pockets) even if some things are different. At least, Grant’s jacket’s length is correct, not like Craig’s. But these narrow lapels, in my opinion, aren’t appropriated to these two characters, who are both very strong. Even Connery’s lapels, in this scene, are not so narrow as Grant’s, and he is less strong than Grant -in terms of stature, I mean. Hi Matt, since you provided an accurate picture of Grant’s and Connery’s cuffed trousers, can you tell if both have the same turn-ups’ height ( 1.6 inches I would say ?) Or is it diffrent ? Thanks a lot. Good piece, but Grant wears a different suit to this for most of the movie with a royal blue tie (in fact, pretty much all his scenes before the Sirkeci Station). 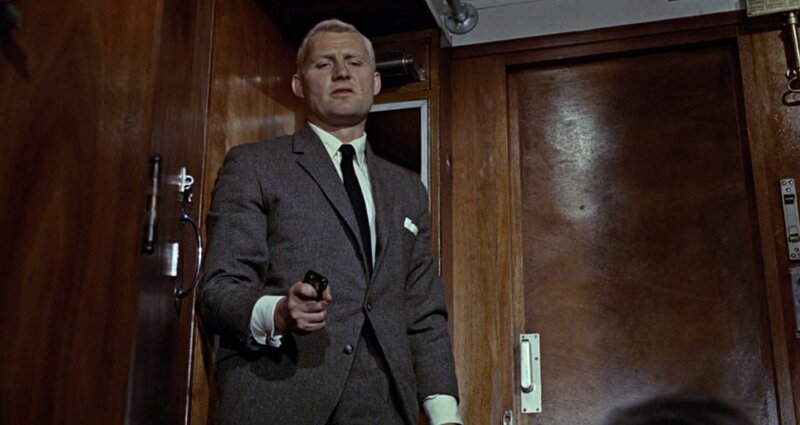 Surprised you’ve not done a feature on that suit as yet – if only because it does look great on Robert Shaw, and because that suit probably gets more screen time than on any other Bond villain. Please could we see a feature on that? I will certainly write about the other outfit in the future. I chose this one since it’s the one in the scenes that feature Grant the most and the one he wears in the epic fight. He wears the other outfit a lot too, but he’s mostly in the background in those scenes. It looks like Grant wore classically cut trousers, much wider at the bottom of the leg than Connery’s. Matt, since this blog is all about details, have you any idea of their width, compared to Connery’s ? Thank you. By the way, do you plan to cover Grant’s grey checked suit soon ? Connery’s trousers are about 16-17 inches at the hem but Grant’s aren’t more than an inch wider. I’m not sure when I’ll be covering Grant’s checked suit. I re-watched FRWL last night and was rather taken with Grant’s other suit, a grey gun club check, which he wears in all of his Istanbul scenes. Certainly worth a detailed look sometime, another classic English suit.